With version 5.3 of 1Password for iOS, the team at AgileBits has shipped considerable improvements to the app's action extension, launched alongside iOS 8 back in September. In the updated app, the extension is now almost on par with the browser extension found in 1Password for desktop computers, which means I'll no longer wish for the “real” 1Password extension whenever I'm logging into websites or setting up new logins on my iPhone and iPad. 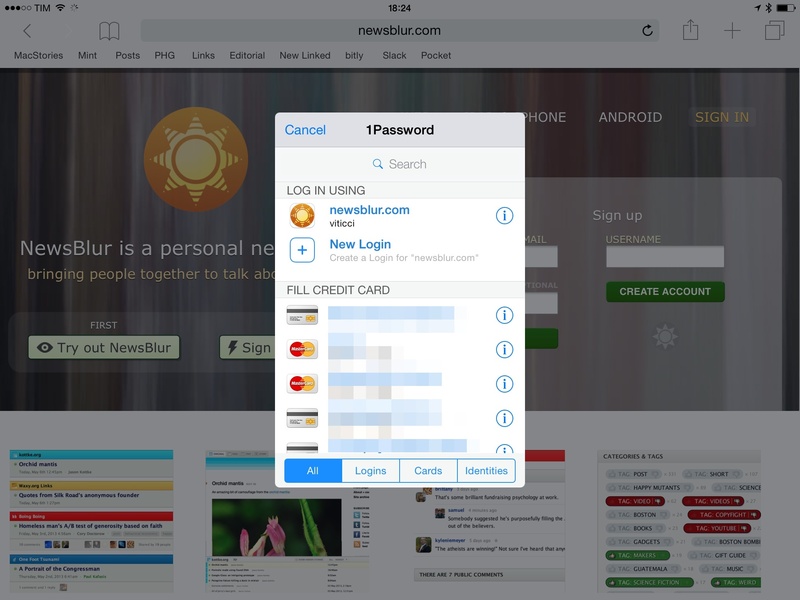 With the update, the 1Password extension can now fill identities, credit cards, create new logins, and access all logins in Safari and third-party apps that feature 1Password integration. While supporting these new fields in third-party apps is up to developers due to how extensions are activated from the iOS 8 share sheet, I was able to test most of the new functionality from Safari, which gets support for identity and credit card filling out of the box. I can now use the 1Password extension for logins, credit cards, and identity fields on any website in Safari, consolidating my workflow in 1Password and avoiding the dualism of 1Password and iCloud Keychain in the browser. After updating 1Password, I logged into a handful of websites that contain my identity and credit card information and, just like on OS X, I hit the 1Password icon and I was presented with a sheet featuring tabs for logins, identity, credit cards, and all entries associated with the current webpage. Then, I picked one of my credit cards, and the 1Password extension filled the required fields for me in Safari – just like I'm used to on the Mac. I tested the extension in identity and credit card mode on various websites, and it worked reliably and consistently with its desktop counterpart. I was already incredulous when I first tried the first 1Password extension for iOS 8, but this update takes it to another level of usefulness, edging towards feature parity with the Mac version. This is particularly handy on iOS devices, where interactions ought to be brief and taps are precious. I also want to note how the 1Password extension allows for the creation of new logins contextually to the app you're currently using without forcing you to jump between apps to copy and paste usernames and passwords. The login creation flow is modelled after the redesigned process AgileBits introduced earlier this year, and it works just as well from the action extension. It's good to see that AgileBits leveraged the past few months and improved stability of iOS 8 to fully take advantage of the new extensibility features and expand the functionality of their action extension. I'm curious to see how the new options will be used in third-party apps, but, in the meantime, you can get 1Password 5.3 from the App Store.